N.B. This qualification is also available in a ‘Fast-Track‘ form (only available to organisations – conditions apply). This qualification is intended for those who are or will be acting as Assessors, assessing candidates’ real work (performance), in normal work environments, using observation and questioning as the principle assessment methods. Assessor candidates will be assessing their candidates against PERFORMANCE standards such as NVQs/SVQs (QCF and NFQ varieties), In-House Competence Standards, etc. Note: This is also the Assessor Qualification used to accredit BESC (Basic Electrical Safety Competence) Assessors. The Unit 301 is a knowledge Unit and as such, candidates will have to demonstrate the knowledge and understanding required to prove that they know and ‘understand the principles and practices of assessment’. Knowledge and understanding evidence for Unit 301 may be identified and provided within activities relating to the assessment of candidates however, generally this Unit will be covered by assessor candidates completing an assignment or professional discussion. Unit 302 is the performance Unit and as such, Unit 302 candidates will have to demonstrate their competence by assessing at least 2 candidates against PERFORMANCE standards such as NVQs/SVQs (QCF and NFQ varieties), In-House Competence Standards, etc. Please be aware that whilst The Gill Payne Partnership Ltd can support the Assessor Candidate through their online qualification, we do not provide or source candidates for the Assessor Candidate to assess. 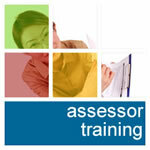 That is the responsibility of the Assessor Candidate. Assessor candidates will receive an Initial Assessment Plan laying out what they must do and provide as evidence towards their qualification. At some point, assessor candidates will have to be observed assessing at least 2 candidates using at least 4 assessment methods across the 2 candidates. Observation can be conducted in a variety of ways. Once the training has been completed, Unit 301/302 candidates will have to complete an assignment/professional discussion to explain in detail to show that they know and understand ‘the principles and practices of assessment’ plus provide evidence as per the assessment plan of their competence as Assessors in the work environment. To complete Unit 302 Assessor Candidates MUST be observed assessing at least 2 candidates on two separate assessments each, conducting 4 assessments in total. This assignment and evidence can be submitted via an ePortfolio or by Paper Based Portfolio (postal submission).